How to Make a Debt Repayment Plan - Women and Money Inc.
At Women and Money Inc we love giving debt advice to women, because debt is such a private and unspoken topic that affects almost every family, and with devastating weight. Many women not only have their own debt, but also deal with their husbands debt as well. And we find it’s often like asking for directions, men may be too proud to ask for advice so women are often the ones to step up. Married or single, you can tackle the debt in a logical and effective way. 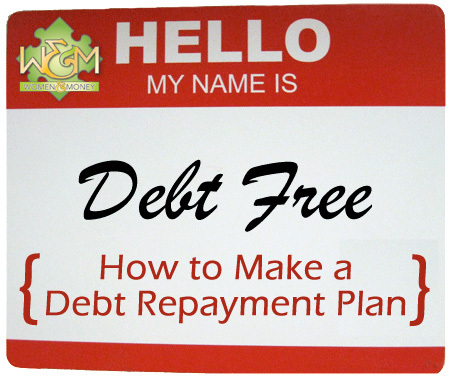 So take control of that debt and read on for how to make a debt repayment plan. 1. The first step in addressing your debt problem is to know your debt. It is surprising how many people lose track of which creditors they owe to and how much they owe. Another surprise is the debt listed under our names at the credit bureau may not always belong to us – sometimes it’s mistakenly attached to the wrong person’s file or not removed when it was paid off in the past. So before you do anything with your debt, get a current copy of your credit bureau. You can get it for free via snail mail, or you can pay online for instant access. Here’s the place to request your credit bureau: Equifax and Trans Union both have Canadian credit files, but Equifax seems to have more files and more current updates so go there first. And if you like, you can also note down what the original amount of the debt was and when it was originally borrowed if that will be useful or motivational to you. 3. Figure out how much money you have available to put towards debt repayment every month. Tally up all of your income, deduct all of your regular household expenses (not including debt payments) and calculate the remaining. If you do not know your monthly expenses, download our free budget spreadsheet and fill it out (look at your bank account statements, credit card statements or recent receipts for how much money you spend on what). 4. If you find that your remaining income is not enough to pay for your minimum debt payments, or just barely, you probably won’t be able to tackle the debt on your own. The money isn’t there to get ahead, and you will gradually be going deeper and deeper into debt. You need help, and that’s ok, because the good news is that debt help is available for you. Our Canadian Government licensed debt relief program will reduce and often remove interest, establish affordable monthly payments with your creditors, and help you to master your debt within 5 years or less. Call 1-877-944-9980 to talk to a qualified credit counsellor at Solutions Credit Counselling Service Inc. or Women and Money Inc. (it’s free and confidential). 5. If you discover that you do have enough surplus income to make all of your minimum debt payments and more, then you can establish your own debt repayment plan. which debt is the most expensive, i.e. has the highest interest rate? which debt has the highest minimum payment? Most experts will recommend paying the highest interest debts first, which makes fiscal sense, however there are other factors to consider. Look at your debt picture and decide what’s important to you. Perhaps it doesn’t make sense to you to focus on repaying your car loan first while dragging on your line of credit payments for a vacation you already took. It might help your motivation if you tackle the smaller debts first, so you can pay them off quicker and cross them off your list. Decide a repayment priority based on your specific debts and your personal values. 7. Arrange scheduled payments for all of your debts. All debts will receive the minimum required/pre-arranged payments, except the first priority debt, which will receive all of the remaining debt payment funds. 8. Update your debt tracker spreadsheet to reflect the new payments and scheduled repayment dates. Each time your priority debt is repaid, cross it off the list and adjust your plan. And don’t forget to update your debt repayment plan if you receive increased income or a lump sum of money you can put towards your debt. Remember to give yourself a big pat on the back! 9. If you ordered your credit score number along with your credit bureau report, you may wish to note that on your debt tracker as well, and update the score as it improves with your debt repayment plan. FYI, a score of about 650 is considered to be the median score, whereas below 650 is low and may bring difficulty in receiving new credit and certainly decent interest rates. 900 is the highest possible score while 300 is the lowest. I hope this has helped you develop your personal debt repayment plan in a way that makes sense to you. If you would like assistance with budgeting, or are interested in the government licensed debt relief program, please contact me.